Acorns can be kept for years. Acorn flour is heavy and will work best when you use it as less than half of the flour mixture in the recipe. Almond flour is very soft and has the same feel and appearance as traditional white flour. It is made from ground up raw almonds. This gluten free flour is perfect for quick flour recipe but not for rising dough recipes. Amaranth is an ancient seed used widely in Mexico. It is particularly dense and does best as less than one-third of the flour mixture in a recipe. Amaranth flour requires little water and longer baking time. Arrowroot flour has the same consistency and texture as corn starch. Arrowroot is usually used a thickening agent and works well because of its pleasant flavor. Artichoke flour is used in pastas and tortillas. It does not thicken and it not used in a recipe that requires a rising flour. My personal favorite gluten free flour because it makes a perfect bread crumb crust. It has a very nutty flavor and a very high nutritional value. 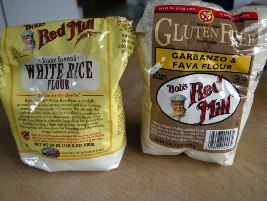 If you enjoy fried chicken or shrimp next time try frying with brown rice flour, you will love this gluten free flour! Chickpea flour is a perfect substitute for soybean flour. This gluten free flour is great for thickening up sauces and soups. It is also great to make bread have a “firmer” feel to it. Buckwheat flour has all eight essential amino acids making it the perfect bodybuilders flour! Buckwheat flour is usually used when making soba noodles and other Japanese dishes. • Cashew flour Cashew flour is very soft and has the same feel and appearance as traditional white flour. It is made from ground up raw cashews. It is perfect for quick flour recipe but not for rising dough recipes. Made from brown rice flour and chia seeds (yes the ones you use for your Chia pet! ), chia seeds are chock full of nutrition. They contain lots of Omega-3s, calcium, fiber, and lots of protein. Chia flour can be used as a one to one replacement for wheat flour. Chestnut flour has a very strong flavor and dark color. It can be purchase extra fine or stone ground and is used in traditional Italian baking. Coconut flour is mildly sweet and commonly used in quickbread recipes and some desserts. It contains high fiber, protein and saturated fat. Corn flour is either yellow, white or blue and is made by grinding up corn kernels. It is very similar to cornmeal but it is much more powdery. This gluten free flour is perfect for tortillas! Corn meal is the same as corn flour but a much coarser grind. Perfect for cornbread! Some people have life-threatening reactions to fava beans. Sometimes they are mixed with chickpeas to make garfava flour. Be very careful when using this gluten free flour. Flaxseeds are super high in Omega-3 fatty acids. They have a nutty flavor and work best in quickbread, and cake recipes. Guar gum is very popular in gluten free baking because it increases the chewiness to doughs. Guar gum is made from a part of the guar bean ground up. Hazelnut meal is very soft and has the same feel and appearance as traditional white flour. It is made from ground up raw hazelnuts. It is perfect for quick flour recipe but not for rising dough recipes. Kudzu is a clear thickening agent and works great in sauces and jellies. It has a nice, mild flavor. Made from the lotus root this cream colored flour is used in the batter for deep frying. It is very popular in Chinese cuisine. Macadamia flour is very soft and has the same feel and appearance as traditional white flour. It is made from ground up raw macadamias. It is perfect for quick flour recipe but not for rising dough recipes. Very similar to potato flour, Malaga flour us used as a thickener or as a great substitute to wheat flour. Mesquite flour is made from mesquite seeds by milling and sieving the pods. The flavor is rich and deep, often compared to chocolate or coffee. Very easy to digest, millet flour is sweet and buttery and works great in tortilla or pancake recipes. Make sure it is certified gluten free oat flour. Oat flour is very moist and flavorful and has a high nutritional and oil content. A great flour for desserts. Pistachio flour has a shelf life of six months. Potatoes are cooked and finely ground to make this light flour. Potato flour works great as a substitute to wheat flour. Potato starch brings moisture to gluten free baking and is a great thickening agent for soups, stews, and gravies. Made from ground, raw pumpkins seeds pumpkin flour is a dark flour with a very nutty flavor. It works great in quickbread and pastry recipes. Quinoa flour has a high protein content and works great to moisten baked goods. Sago palm stems are used to make this flour. It is commonly used in Indonesia and Malaysia to make noodles and white bread. This gluten free flour is mildly sweet and has a bit of an aftertaste. It is commonly used to make gluten free beer or animal feed. Made from sweet potatoes this flour works great in baking or as a thickening agent for sauces and gravies. Made from short grain white rice this flour helps bind other flours in the recipe together due to its “stickiness” properties. Sweet white rice flour is very similar to brown rice flour. White rice flour is high in protein but low on nutrition. It cannot be used alone in baking and works best as a thickening agent for sauces and puddings. Developed by the US Department of Agriculture and made from the black rot on broccoli and cauliflower xantham gum is commonly used in ice cream, salad dressings and dairy products. It is commonly used in gluten free cooking as a substitute for wheat gluten. Made from yams dried and ground, yam flour works great in cookies and pie crusts.